WE DON’T NEED A NEW GRAND BARGAIN. WE NEED TO STRENGTHEN THE ONE WE SIGNED 4 DECADES AGO. 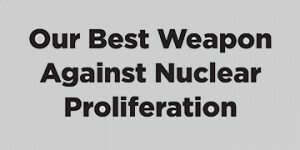 For nearly 40 years, the Nuclear Nonproliferation Treaty (NPT) and the International Atomic Energy Agency (IAEA) have provided the stability and the structure necessary to control the spread of nuclear weapons. Without the NPT, there is no doubt that more countries would possess nuclear weapons. Without the IAEA, which has functioned as the indispensable watchdog monitoring civilian nuclear activities and reporting on potential violations of IAEA safeguards, the world would certainly be more dangerous. continue to be important tools for the global community to confront countries that develop nuclear capabilities in violation of their commitments and to reduce the risk that terrorists will acquire these devastating weapons. As we prepare for the NPT Review Conference in 2010, we, the undersigned Republicans and Democrats, strongly encourage the Obama Administration to take decisive action to support the NPT and the IAEA. – Reaffirm the NPT as the cornerstone of global nonproliferation and disarmament efforts by sending a high-level delegation to the 2010 Review Conference. – Strengthen enforcement mechanisms for use against countries deemed in violation of their NPT obligations. – Commit to work with all states possessing nuclear weapons to reduce arsenals to the minimum achievable level. Enhance U.S.-Russian cooperation and joint leadership on non-proliferation and disarmament, including renewal or replacement of the Strategic Arms Reduction Treaty (START). – Promote measures to ensure that all countries have access to peaceful nuclear energy without creating additional risks of proliferation and terrorism. – Establish multilateral arrangements, such as assured international fuel supply mechanisms, to discourage the spread of enrichment and reprocessing capabilities. – Support the IAEA safeguards mission through an increase in resources, training, equipment and personnel, and assist other states in using peaceful nuclear applications to address poverty and the challenges associated with underdevelopment. – Work with NPT and IAEA member states to increase the IAEA’s authority for greater access to suspect nuclear sites and universal implementation of the Additional Protocol. – Encourage countries to participate fully with IAEA nuclear security programs to help ensure that nuclear materials are not accessible to terrorists. – Work aggressively to complete a verifiable, irreversible, and nondiscriminatory Fissile Material Cutoff Treaty (FMCT). – Continue to work aggressively to ensure high confidence in stockpile reliability and multilateral verification mechanisms compatible with a comprehensive ban on nuclear testing. This project is made possible by the generous support of Ploughshares Fund.